One of the best reasons to set up a home automation system is to gain remote control of lights around the house from anywhere, near or far —so you can, for example, dim a group of lamps in the living room all at once when you’re about to watch a movie, or switch on and off different lights at different times while away to make a vacant home seem occupied. But setting up such a system can be a daunting and costly task for most people. So General Electric, the company that sold the first commercially viable light bulb invented by Thomas Edison, now is aiming to make the job as simple and inexpensive as ever —with Link, a new remote–controllable light bulb it’s selling only at Home Depot and select Target stores. An LED bulb that’s meant to replace old–fashioned incandescent bulbs that are no longer legal to sell in the U.S., Link is available in three forms: a 12–watt soft white light bulb that replaces a standard (“A19”) 60–watt bulb; a 10–watt soft white light bulb that replaces a ceiling fixture (“BR30”) 65–watt bulb; and a 13–watt indoor/outdoor–rated bright white light bulb that replaces a spotlight (“PAR 38”) 90–watt bulb. 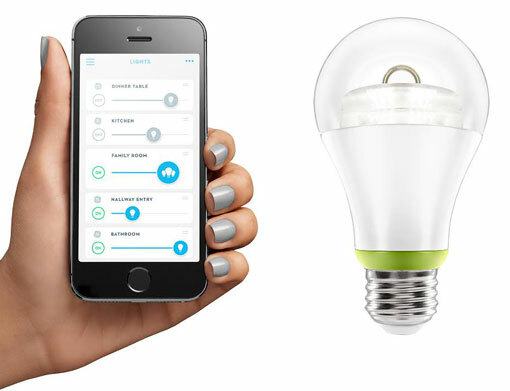 To control a Link bulb, it must first be installed in a lamp, then paired with a separate hardware device, the Wink HUB ($49.99 on Amazon), from New York–based Wink, Inc. Pairing is accomplished through the Wink App for smartphones or tablets (iOS or Android, free), which is also used to send on–off and dimming or brightening commands to the bulb, and to set up groups of bulbs that can be controlled simultaneously. The Wink hub connects to the user’s home network via Wi–Fi, the App connects with the hub via Bluetooth, and the hub connects with the Link bulb via another wireless networking technology named ZigBee. Z–Wave and Lutron Electronics Co., Inc.’s ClearConnect—wireless networking technologies used by other connected home automation products —also are built into the Wink hub. More such technologies could be added as they’re introduced by the home automation industry or companies, via a simple “firmware”update through the home network’s Internet connection. Besides the GE bulbs, the Wink hub and app can be used to manage numerous connected home automation products from a variety of brands, including door locks from Schlage and Kwikset ($199 each), the Honeywell Wi–Fi Smart Thermostat ($229), the Chamberlain MyQ garage door controller ($129), and Philips Hue color–changing LED light bulbs ($59.97–$69.97). Unlike the Link bulbs, not all of those “Wink–enabled”products require the hub; some can be operated via the app alone. Users can program the Wink app to offer “Robots”and “Shortcuts.”The former collectively control disparate products based on a trigger such as location or activity —for example, turning on specific lights and opening window shades when a door is unlocked. The latter are like “playlists”in iTunes; a “movie night”shortcut may automatically dim a group of lights in the living room to a preset brightness, or a “welcome home”shortcut may automatically turn on lights in hallways, the kitchen and a bedroom. Announced last June, all three Link bulbs arrived just this month at all Home Depot stores nationwide and at HomeDepot.com. Some Target stores also are selling them now, and additional Target stores are expected to have them later. GE has set prices for the bulbs aggressively low. The A19 bulb sells for just $14.97, the BR30 sells for $19.97, and the PAR 38 sells for $24.97. Each is just $5 more than an equivalent GE LED bulb without a remote control function built in. As well, the Link A19 bulb price is just one–fourth that of the comparable Philips Hue remote controllable light bulb ($59.97 on Amazon) —although, notably, the GE Link bulbs cannot change colors. By comparison, Amazon sells the Wink hub, too, regularly priced at $49.99 (or $30 off MSRP), and sells only the A19 Link bulbs for $23.99. Thus, the Link portfolio will grow, GE says; additional bulb shapes are expected to be available early next year, including in–ceiling “recessed can” bulbs.